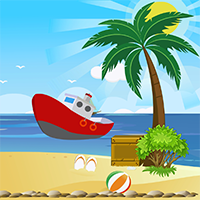 AVM Escape Beach Resort is another point & click escape game developed by AVMGames. You are finally in this wonderful beach resort after a long drive. You read many good reviews about this location, so you are very happy that you are here right now. However, all of your expectations turned upside down when you saw the resort: this is not what the reviews said! There are no hotels, and there are also no parties here. When you looked at your map, you realised that you went to the wrong beach resort. You really don't want to spoil your vacation. You are willing to drive for another few miles just to get to a decent holiday spot. The problem is: you don't have a map that can show you the way. On a good note, there are clues that can lead you to the right way out of this beach resort. Good luck and have fun!